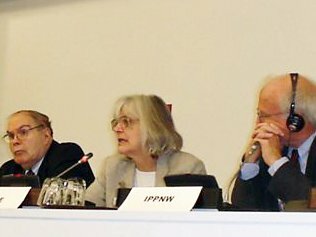 IPPNW presented a side panel at the second session of the Preparatory Committee for the Arms Trade Treaty on February 28, entitled Control the Arms Trade: Improve Human and Environmental Health. The panel was co-sponsored by Zambia, and included physicians from that country, the United States, and Austria who spoke about the human health and environmental dimensions of the full cycle of the arms trade. The panelists addressed how a robust Arms Trade Treaty can help promote health and reduce environmental contamination. The week-long ATT PrepCom convened on February 28 at the United Nations Headquarters in New York City. The PrepCom is expected to recommend essential elements of a legally binding international agreement to regulate transfers of conventional arms, to be negotiated in July 2012. The IPPNW session was moderated by Victor W. Sidel, MD, Distinguished University Professor of Social Medicine at the Montefiore Medical Center, Albert Einstein College of Medicine. Dr. Sidel is co-author of The Global Gun Epidemic and is co-editor, with Barry Levy, of War and Public Health. Dr. Bob Mtonga: "We are custodians of health. We are here because we are fed up of mopping the floor while the taps are running...I come here as a witness to the devastation caused by violence. Without a strong arms treaty, this will not stop." Panelist Michael Schober, MD, from IPPNW-Austria, discussed the need for North/South cooperation to reduce gun violence and presented examples of how IPPNW works globally to mobilize physicians and other health professionals to engage in peacebuilding and citizen diplomacy. Donald Mellman, MD from Physicians for Social Responsibility (IPPNW-USA) addressed the crisis of leadership that has led to a health crisis in armed violence. He explained how a public health, evidence-based approach that utilizes methods successful in preventing infectious and chronic diseases and injuries including polio and malaria, HIV infection, smallpox, and automobile injuries can be harnessed to prevent violence. Cathey Falvo, MD, MPH, of the International Society of Doctors for the Environment, focused on a lesser known dimension of the arms trade — how competition for environmental resources can foster conflict, and how conflict can have devastating effects on environmental health. The panel concluded with testimony from IPPNW Co-President Robert Mtonga, MD (IPPNW-Zambia), who related three “one bullet stories” about the human consequences and suffering arising from arms use. 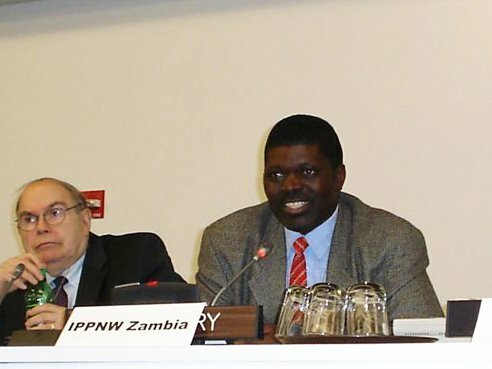 Dr. Mtonga’s experiences with the victims of armed violence led him to remark that he was “fed up with mopping the floors while the taps are running.” His work with other health professionals in Zambia and elsewhere have helped to quantify economic and social costs to countries struggling with competing needs for health care and development dollars.